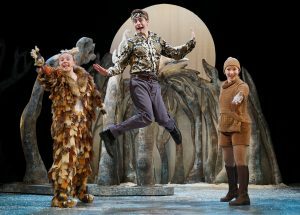 Julia Donaldson and Axel Scheffler fans are in for a Christmas treat this year, as The Gruffalo’s Child has arrived in the West End. Tall Stories’ production of The Snail and the Whale at The Albany in Deptford last year was so fab that we were really keen to check out their current offering. The Gruffalo’s Child is aimed at 3-6 year olds – perfect for 4 year old G. Our Saturday morning performance was at 10am. It’s a great time of day to travel into Central London with little ones; we got to enjoy the Christmas lights and shop windows, without any of the usual crowds. It makes a change to see a show at a proper West End venue once in a while. Most of the children’s theatre we’ve seen recently has been produced in more intimate studio spaces, so this trip felt special. There audience buzzed with excitement as we took our seats in the stalls. The show, directed by Olivia Jacobs, is deceptively simple. There are just three cast members and a pretty basic set. But with some nifty costume changes they manage to bring the story’s seven characters to life. Given the book is a 5-minute read, the show doesn’t follow it that closely – there are songs and sections of audience participation which help to pad it out to around an hour or so (just about right for G’s attention span). 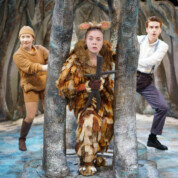 Sophie Alice and Catriona Mackenzie are playful and engaging as the Gruffalo’s Child and the Narrator respectively. For us, the star of the show by far is the extremely versatile Andrew Mudie, switching seamlessly between the Gruffalo, Snake, Owl and Fox. The Gruffalo’s Child’s encounters with these predators sets up most of the interactive elements of the show. The flamenco-dancing snake, RAF-inspired owl and wheeler dealer Fox each invite the audience to join in the singing and dancing. G was flapping his arms like mad along with the owl and shouting “olé!” during the flamenco section. By the end he was left wide-eyed and speechless for a few minutes until he’d absorbed it all. The Gruffalo’s Child makes a fab, family Christmas treat. Despite not being a Christmas story per se, it’s set in winter and the snowy scenes feel festive. Julia Donaldson fans will also enjoy spotting other references, such as the Gruffalo’s Child’s Stick Man toy. 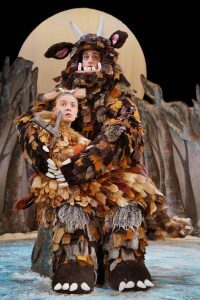 The Gruffalo’s Child is at the Lyric Theatre until 7 January 2018. Tickets cost from £15.60. If this tickles your fancy, then you might also like A World Inside A Book: Gruffalos, Dragons & Other Creatures at Discover Story Centre until September 2018. Visit babydaytripper’s list of reviews for more fab day trip suggestions. We attended a press preview of this show, but all views expressed are our own.